Conflict is an inevitable part of public life, but it doesn’t have to be a barrier to success when handled effectively, efficiently and respectfully. Study a discipline that will make you the most valuable person in the room. Become an expert in conflict management—your skills will be transferable in any workplace or setting. Explore the building blocks of dispute resolution, learn how to navigate conversations in the midst of difficult problems in negotiation and mediation, and develop processes for solving complex issues in the face of conflict. 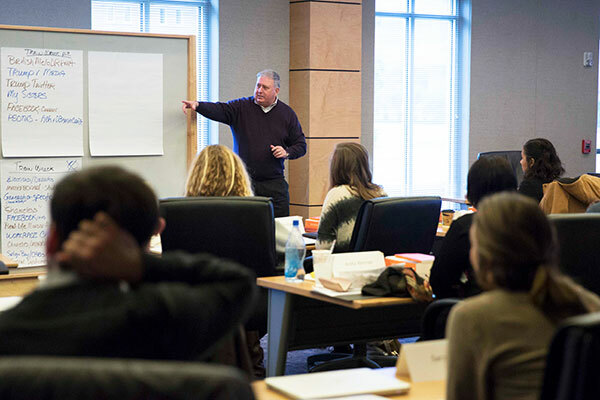 You’ll be equipped with the tools to recognize, understand and alleviate conflict in intrapersonal, interpersonal, organizational and governmental settings. Wherever conflict arises, be fully prepared to meet the needs of your workplace, community and family. Every aspect of our program and curriculum reinforces our goal of providing you with the tools to diagnose, manage and heal conflict in all settings. We are committed to bringing real world experiences into the classroom by having you study under globally recognized conflict management practitioners. Our program is designed with professionals in mind so that you can balance work and school. With few exceptions, each course meets for two Friday and Saturday sessions. Take between one and five classes per semester and choose the pace that works best for you. We also offer online and hybrid options in many of our courses. Frequent advising ensures a personal relationship and focused mentorship opportunity for all graduate degree candidates. In the summers, you’ll have a travel opportunity—in recent years, this has been to Europe. Your final three credit hours are devoted to a research project that allows you to dive deeply into a particular area of interest, gather research, and produce a writing suitable to diagnose and treat a specific conflict. Individuals are welcome to apply to the conflict management program from all academic disciplines and professions. Students with undergraduate degrees from an accredited university will have met all prerequisites. Graduate Application Form: The Institute for Conflict Management offers graduate programs with two entry points per academic year, August (fall semester) and January (spring semester.) Although we offer rolling admission, all candidates are encouraged to complete the online graduate application at least 4-6 weeks before courses begin. Application Fee: A non-refundable $50 application fee must be submitted before the application is evaluated by the admissions committee. Official Transcripts: Official transcripts from all previously attended colleges and universities are required. Transcripts must be sent from the university of attendance in order to be considered official and can be either hard copy or electronic. References: Each applicant is required to submit two references. You can either use our form or send from within the online application. Personal Statement/Essay: A written response of less than 1,000 words responding to the following questions may be submitted within the online application: (1) What draws you to study conflict management? (2) What are your personal and professional goals and interests? and (3) What are your expectations of this program? On-Campus Interview: After all application documents are received and academic requirements are met, an on-campus interview will be scheduled. For the 2018-2019 academic year, tuition for conflict management courses is approximately $1,070 per credit hour. Payment is due prior to each class or at the start of the term. A number of graduate scholarships and assistantships are available. These are offered by individual departments and programs and may be awarded based on academic standing, work experience and financial need. All assistantships will include responsibility for administrative, teaching, or departmental duties, depending on the program. Partial scholarships are available.